I have always loved the flavor of black sesame. I love the black sesame soup you can get at Chinese restaurants. I love black sesame filled mochi. So when I stumbled across a can of black sesame paste earlier this year at a Chinese market, I knew it would make the perfect filling for some black sesame macarons. One of my favorite flavors in my favorite French confections! What could be better? I always start the process by aging my egg whites on the kitchen counter two days before I plan to make macarons. My mom believes that letting egg whites sit at room temperature for more than an hour is a questionable procedure but it really makes all the difference when it comes to making macarons! Besides, I've never heard of anyone getting sick as a result of aged egg whites in macarons. 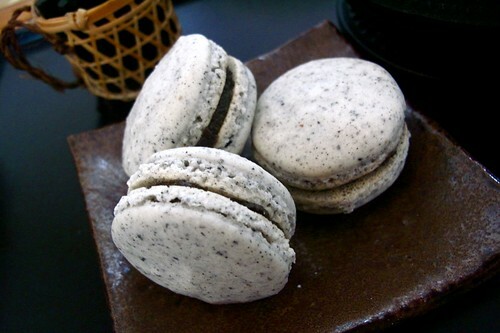 For these macarons, I combined blanched almond slivers and black sesame seeds in a food processor with some of the powdered sugar until it turns into a fine flour. I then combine that mixture with the rest of the powdered sugar. To make the meringue, whip the egg whites until frothy and add the granulated sugar in little by little until it forms stiff peaks. The next part can be very temperamental. I fold the meringue into the almond mixture in two parts using a spatula. The best description I can give for the consistency you want to obtain is the consistency of lava. Really--molten lava. Don't be afraid of folding it. Granted, over-folding could prove disastrous but don't be intimidated. The mixture does need some good folding until it reaches the perfect consistency. Another way to tell when the mixture is ready is to lift up your spatula and the batter should fall back down in a thick ribbon. Line two baking sheets with silpat and pipe the batter into 1 inch rounds. The batter will spread a little so don't make them too big or too close together. It is also crucial to let the piped macarons shells sit out for a good 30 minutes, or until slightly hardened. 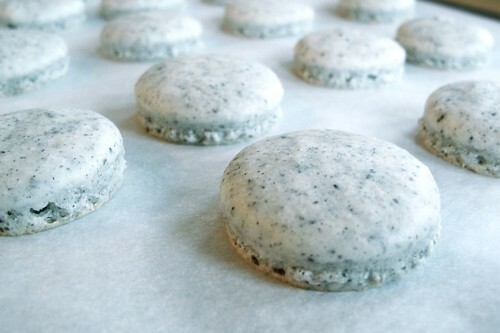 This allows them to develop the coveted "feet" of the macaron. Bake for 15-20 minutes and hopefully you end up with perfect little macaron shells to fill with sesame paste! perfect with a cup of green tea! My first and only attempt at making macarons was a complete disaster; and I have been afraid to give it another go. This, however, has inspired me to make some soon! Thank you (and wish me luck)! 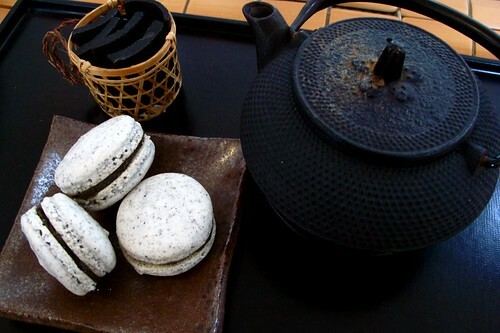 Sesame macarons sound so good! I still want a Christina Macaron! Can you post the recipe on the filling too?